Powers/Abilities: Mastermind had some degree of technological and/or business training. He used the Smashers as his field agents, and had access to various guns, bombs, and helicopters. (Iron Man I#31) - Bowers ran the division of Stark Industries on Lakini, but he began embezzling large amounts of money. Tony Stark learned of the loss of money and came to Lakini to investigate. To cover up his crimes Bowers began trying to destroy the plant, such as by drumming up a false pollution crisis and promoting riots and rebellion. Taking the identity of Mastermind, he hired a group known as the Smashers to pose as protesters. (Iron Man I#31) - While Major Ffoulkes led a peaceful protest against Stark Industries, Mastermind sent the Smashes to escalate things into a riot. The Smashers fled once Iron Man arrived to break things up, and they were chastised by Mastermind for their failure to assault Tony Stark himself. Mastermind reiterated their goal to drive Stark from the island. Stark was impressed with the assistance of SI employee Kevin O'Brian, who also impressed Stark with his technological skills. Stark questioned Bowers regarding the loss of money and the complaints of O'Brian, but Bowers repeatedly tried to sidestep the issue. Mastermind had the Smashers plant explosives with SI Lakini, but Iron Man captured both Mastermind and Bullwhip Grogan, the leader of the Smashers, and brought them into the plant, threatening to keep them there until the bomb went off. Grogan finally cracked and deactivated the hidden bomb, after which Iron Man publicly unmasked Mastermind, revealing that the pollution crisis had been propagated by him. Iron Man agreed that pollution needed to be dealt with and convinced the people of Lakini to listen to Stark's plans to keep the environment clean. Comments: Created by Allyn Brodsky, Don Heck, and Chick Stone. 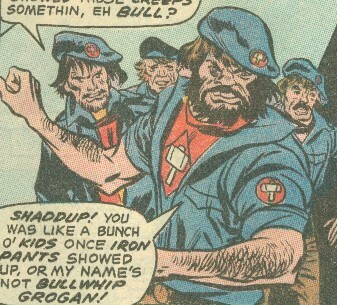 Known members include "Bullwhip" Grogan, their leader, and Ratzo. They were hired by Mastermind to stimulate violent protest against Stark Industries, assault Stark himself, blow up the plant, etc. They were armed with conventional weaponry and explosives. Retired British Army, he led several rallies against Stark Industries Lakini, talking about mutation, etc. caused by pollution. He refused to listen to Stark's plans to deal with pollution, preferring to just continue his arguments. He was easily duped by Mastermind's plot. She was daughter to Hubert and the girlfriend of Kevin O'Brian. She sided with protesters and consistently criticized Kevin, such as when he broke up a violent attack by the Smashers. When he considered taking a promotion to Stark Industries Long Island, she accused him of taking a payoff. Kevin left her shortly thereafter to take a the U.S. job and she did not appear to be missed.